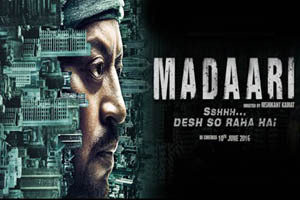 Madaari is a 2016 Hindi social-thriller film directed by Nishikant Kamat and produced by Shailesh Singh, Madan Paliwal, Sutapa Sikdar and Shailja Kejriwal. The film stars Irrfan Khan, Vishesh Bansal, Jimmy Shergill, Tushar Dalvi and Nitesh Pandey. The soundtrack of film is composed by Vishal Bhardwaj, Sunny Bawra and Inder Bawra, with lyrics penned by Irshad Kamil. Here is the link of all the songs lyrics and videos of Madaari.